Youth is something that we fail to cherish when we’ve got it, but long for when it’s gone. In our societies, youth is something that everyone seems to be striving for. We want to keep our skin soft and supple. We want our muscles to be tight and toned. We hope to avoid wrinkles and grey hairs, and we do anything that we can to prevent stretch marks, cellulite and varicose veins, which could age us. We spend so much money in search of everlasting youth, and most of it is wasted. Unfortunately, there isn’t a magic cream to keep your skin line free and soft, and there’s little that you can really do to avoid grey hairs, other than cover them up. Aging is something that happens to the best of us, and there is no avoiding it. Even if you are lucky enough – and luck plays a big part! – To look young into middle age, your mind could give you away. You might find that you start to forget things, that you can’t remember names or details and you start doing odd things like putting your gloves in the freezer, much sooner than you might expect. We blame things like baby brain when we are having children, or tiredness when we’re working long hours, but the truth is that it is a natural part of getting older. In truth, the best way to grow old will always be gracefully. Plastic surgery and other drastic anti-aging techniques will always be tempting to those of us that value youth, and all those high-end, exceptionally expensive creams that promise to take ten years off your face, will often catch your eye. But, it’s important to remember that there is nothing wrong with getting older. It’s something we should all be aiming for. With age, comes wisdom and many people find that if they just let themselves, they love their bodies much more than they did in their youth. But, aging gracefully isn’t the same as letting everything go. Looking after your body and your mind can ensure that you are able to live a long and healthy life. That your body and brain won’t let you down, and that you can truly love yourself, knowing that you are doing your best to give yourself the best chance of an active and healthy future. Here are some of the very best things that you can do for your body and mind, to keep you looking and feeling at your best, even as you get older. Loving your body is easier said than done. But, as you get older, you often find that you think back to how your body used to look with regret. We regret that we ever thought we were fat and that we didn’t appreciate what we had. When you are 30, you’ll think of how great you looked when you were 20. When you are 40, you’ll believe that your body was amazing when it was 30. By 50, you might well have learned to love what you’ve got instead of thinking about what you had. Your body is going to age and change. But, it’s the only one that you will ever have. Learning to love yourself, and appreciate everything that your body does for you, helps you to enjoy it. This can be a massive boost to your confidence, and help you to feel more youthful at any age. Loving your body will help you to treat it well, and exercise is the very best way to do this. You don’t need to be a long distance runner or a champion swimmer to exercise enough to take care of your body. Nor do you need to be in the gym twice a day. You just need to move. Cardio exercise is great for your muscles, your stamina, your circulation and your stamina. It can also help to boost your mental health and confidence while helping you to achieve or maintain a healthy weight. 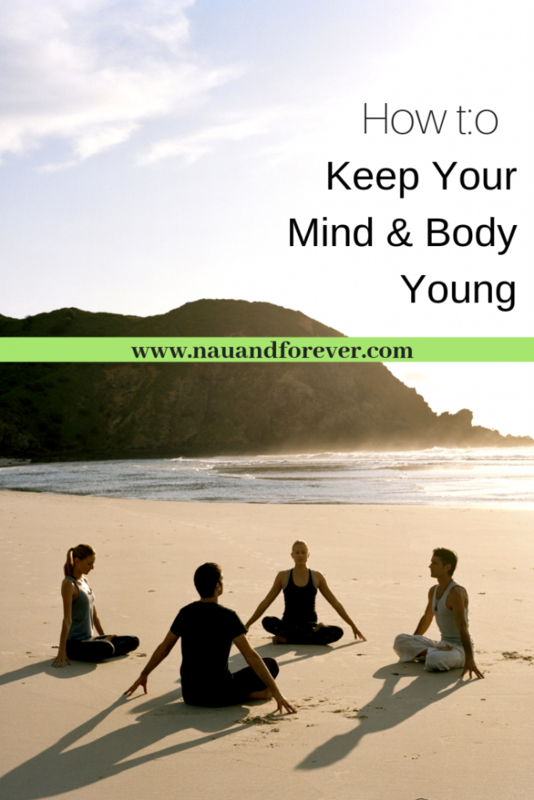 All of which will help to keep your mind and body young. Try to fit in at least three thirty minute cardio workouts a week for a healthy lifestyle and to decrease your risk of heart attack, stroke, diabetes and other health conditions as you age. Cardio exercise is anything that gets your blood pumping and your heart beating faster. This includes things like jogging, swimming and brisk walking. Strength training can also be beneficial, as it builds and tones muscles, increases your flexibility, improves your heart health and also helps you to manage your weight. But, that doesn’t mean that you need to hit the weights. Pilates and other matt exercises can use your own body weight for strength training. Your diet is as important as exercise when it comes to living healthily. And, believe it or not, can help to keep your mind healthy as well as your body. Try to eat a well-balanced diet, with plenty of fruits and vegetables, as well as oily fish and complex carbs. Healthy meals don’t have to be boring though. Healthy meals can be tasty, filling and comforting. They can be loaded with nutrients and minerals, but still, be varied and exciting. A big part of this is enjoying food and allowing yourself to experiment with new flavours and new meals. Try things, cook as much as you can, and let yourself love food without overindulging. Your body isn’t the only thing that needs a workout if you want to stay young. You also need to exercise your mind, and it’s never too early to start. When you get older, living in aged care can help to exercise your brain by keeping you around other people and avoiding isolation. But, before then, you might find that you don’t use your mind as often as you should. When you are just going through the motions of life, it’s easy to stop thinking about things. This can lead to your mind prematurely aging and even some serious health conditions. Exercising your mind however doesn’t need to be difficult. You just need to use it more. Puzzles, books, doing things with your opposite hand and having interesting conversations with different people can be a great help. But, generally, it’s just about being open to learning new things. Those of us that never stop learning, often feel more alert and find it easier to focus. Let your children teach you things, read non-fiction books and watch documentaries. Visit museums and take up new hobbies. Laughter isn’t just great medicine. It’s also a useful anti-aging tool. Laughing boosts the blood to your face, which can help you to look younger and research shows that we are more attractive when we smile. It can also help to reduce your stress levels, improve your mental health and reduce your blood pressure. So, spend time with people that make you laugh, doing things that you love and you may find that you feel happier, more alert, that you sleep better and that you feel more at peace. You may feel and look younger, and your health could be improved. Our friends and family make us laugh. They take care of us. They are there for us when we need them and when we are struggling with our health. They boost our confidence and help us to find solutions to our problems. They can be a great source of comfort and support to us, both now and in the future. But, only if we make time for them, and take the time to offer them the same support. Give your friends your time, not just when it’s needed. Relationships take work. You need to maintain them if you want them to stick around. Like laughter and friendships, having hobbies that you love and interests that you feel passion for can help to keep you young and fill your life with joy, but often as we get older, we stop making time for those passions. Start making time for your hobbies, or look for new ones, and you may find that they help to sustain you. When we’re so worried about eating well, exercising and looking after our brains, it can be all too easy to forget to live. When there’s so much to worry about and do, it’s easy to get stressed out and forget to have fun. Don’t be so strict with your diet and exercise that you don’t leave room for fun, or for chocolate. Don’t work so hard that you never have time for holidays, time off and fun days out. So many of us spend most of our time inside. We work in offices. We spend our free time at home surfing the net. We drive everywhere, and we never get as much fresh air as we need to. Getting outdoors more can help to boost your health and your mood, as well as your posture and circulation. Just being outside will mean that you are around people and more fresh air can help you to get a good night’s sleep. They often say that “youth is wasted on the young”. The fact is age is just a number and there are multiple things you can do to continue feeling young and vibrant. If you’re ready to take charge of your life and starting living it, you may consider working with a life coach. Check out how I can help you start living your life today! Wanna Be a Fitness Model?